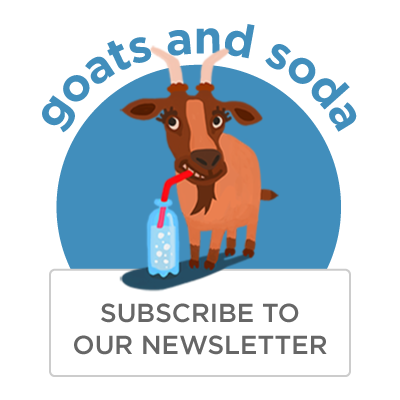 In Egypt, Autism Is Sometimes Viewed As A Curse But Change Is Afoot : Goats and Soda Some people in Egypt think autism is a curse. But a psychologist named Dahlia Soliman is determined to change attitudes. One way to get Egyptians talking about autism? Turn their biggest monument blue — the official color of Autism Awareness Month. When Ranwa Yehia heard her nearly 3-year-old son, Nadeem, making this sound, she got cold shivers all over her body. After three months of saying "cat," Nadeem couldn't say the whole word anymore. Shortly after, Yehia was told she could no longer bring her son to his nursery school unless the family could get another teacher to shadow him in class. What was going on with Nadeem? Yehia and her husband, Ali, who live in Egypt, turned to their family pediatrician and every child development specialist they could think of. No one seemed to have any answers — until the couple sought out Dahlia Soliman, an educational psychologist in Cairo. "Does he point [with] his feet often?" she asked them. "How often does he hug you during the day?" "Does he respond to requests?" The oddly specific questions revealed something Yehia and her husband suspected, as she recounted in an op-ed for the Egypt Independent in 2012. Nadeem is on the spectrum, said Soliman. The psychologist was referring to autism spectrum disorder — a condition that Yehia had heard of but knew little about. It affects brain development and is characterized by varying degrees of difficulties in social interaction and verbal and nonverbal communication as well as repetitive behaviors. That explained Nadeem's backsliding speech patterns, his love of routine and his recurrent tantrums, wrote Yehia, who's the the head of the Arab Digital Expression Foundation, a youth organization. Autism is a tough issue in Egyptian society. It can be viewed as a curse, and children are sometimes caged. But progress is afoot. In April, a beloved Egyptian leader, Vice Admiral Mohab Mamish, head of the Suez Canal Authority, stunned the public with a simple statement: His grandson has autism. And there is growing understanding of the condition, largely due to Dahlia Soliman. 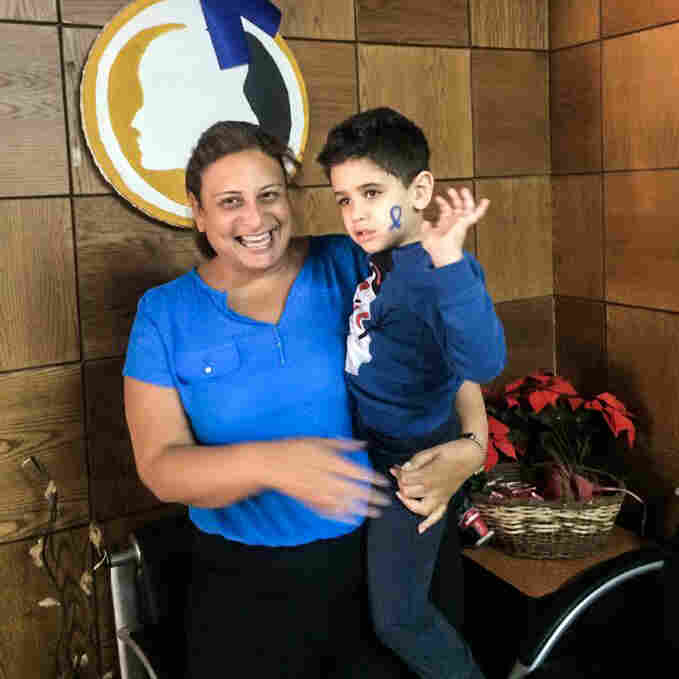 Dr. Iman Gaber, head of the child and adolescent mental health program at Egypt's Ministry of Health, says hardly any Egyptians had heard of the word "autism" before Soliman came on the scene. "People thought it meant 'mental retardation,' " she says. "And there was this one person who thought it meant 'street child.' "
But now, even the highest ranking Egyptian officials have an idea of what autism is. Part of the credit goes to Soliman's big charity events and bold publicity stunts — like lighting up the great Pyramids of Giza bright blue in April for Autism Awareness Month, and urging President Abdel-Fattah el-Sissi himself to build more autism centers in the country. "[The Ministry] could be doing a lot around autism," says Gaber, "But without raising awareness, nothing will happen." Luckily, she says, that's Soliman's strong suit. Another strength? Her willingness to learn. That's what Gaber says makes Soliman an "effective" psychologist. "She's always trying to teach herself new techniques, stay updated with the latest programs, and helping us [psychologists] understand them, too, by translating what she learns into Arabic." Since Soliman founded the Egyptian Autistic Society 17 years ago, she has diagnosed thousands of children like Nadeem with autism and helped parents recognize, understand and treat the condition. But her biggest win of all has been getting more Egyptians to talk about autism. In the Society's early years, nearly 80 percent of her patients with autism had been previously incorrectly diagnosed with intellectual disabilities or cerebral palsy, which is "not even similar," she says. "The biggest pediatricians of Egypt, they'd misdiagnose. They'd tell parents to leave their children in an institute and forget about them." That's quite a big deal. Although there is no official data on the number of Egyptian children with autism, Soliman has used the international rate of approximately 1 in 68 children to come up with an estimate of 1 million. If diagnosed early enough, children with autism may have a better chance of "mainstreaming" — going to regular schools and adapting to society, says Soliman. Age 18 months is the ideal to begin working with these kids. But in many parts of Egypt, especially the poorest areas, lack of knowledge and access to resources about autism can have harmful consequences for the patient — and delay treatment. "In suburban or rural areas, people say [children with autism] have been touched by the devil or cursed — and sometimes parents even cage them," she says. "They're very poorly treated. They're not understood." The stigma doesn't stop after a child's diagnosis — especially in Egyptian culture, where reputation and status are important across all social classes. "I have people who come to me under fake names. Parents hide it from the grandparents and other members of the family," she says. They're worried that a diagnosis of autism could affect the child's marriage chances — or even discourage a prospective marital partner for a sibling, says Soliman. Since she was a child, Soliman has loved working with children with special needs. The daughter of a diplomat, she grew up in the Czech Republic, Liberia, the U.K. and Australia, but back home in Egypt for summers, she'd volunteer at a nursery specifically for special needs kids. "I was an annoying 11-year-old ... who [knew I wanted] to be a psychologist for children [with special needs]," she wrote on the Society's blog last year. To make that happen, she studied psychology as an undergrad at the University of New South Wales in Sydney and in grad school at Bangor University in the U.K. She was then certified in TEACCH, a course that trains teachers how to run children's autism units, at the University of North Carolina. After graduating, she set up a classroom in her apartment in Cairo and started diagnosing and treating autistic children, teaching them everything from how to recognize their parents to how to socialize. With a growing number of patients, she started her own organization in 1999: the Egyptian Autistic Society. She wanted it to be a nonprofit to help those who couldn't afford to pay. She was just 24 years old. And she kept learning. In 2002, she earned her masters in special education at the University of Birmingham. Today, the Society has worked with more than 5,000 children autism and has a staff of more than 40. The annual fee is a little over $2,800 — quite expensive for a country where a quarter of the population lives below the poverty line. "Those who can pay, pay," says Soliman, but about a third of the students are given free services so the group can serve all parts of society. On top of the day-to-day work, Soliman and her group lobby the Egyptian government for more rights for children with autism. So far, they helped facilitate military exemption for people with autism. They met with Sissi and urged him to build six autism centers across the country. And now, they're tackling the Egyptian education system. "There are a lot of legal loopholes that make it difficult to mainstream autistic children in school," she says. "I want to prove that autistic children are educable." Dahlia Soliman celebrates Autism Awareness Month with one of her students, Seif. Ever since she was a little girl, she loved working with children with special needs. That was particularly difficult during the Egyptian revolution, she says. The administration kept changing. "The second we started doing any kind of legal or advocacy work, the ministry would change and [all our work would be] gone. So basically we'd wait to see the next social minister or health minister. It was like waiting for your next class teacher." One campaign that has helped make noise for autism in a big way has been National Autism Awareness Month. Soliman brought the global moment — which takes place every April — to Egypt five years ago. 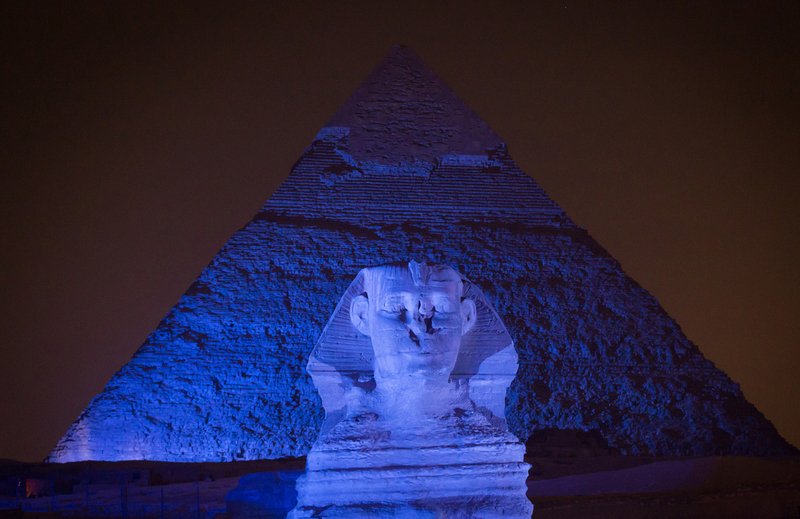 It's marked by a flurry of public walks, runs and bike rides, VIP galas and the piece de resistance: lighting up Egypt's spectacular monuments blue, the official color of the global campaign. In addition to the Pyramids, Soliman has helped turn the Alexandria Library, the Cairo Tower and the Citadel blue. The weeks after Autism Month have now become the busiest time of the year for the Society, with new clients coming in from across the country. The Society's Facebook page — which has become the group's main platform to communicate internationally across classes — hums with messages of support and photos from awareness events. But Soliman sees even more work ahead — making sure medical students are taught about the condition, for example. Yehia, whose son Nadeem is now 9 years old, never doubted Soliman's drive for a second. As an autism activist and the head of a youth-based NGO, she feels that it has become much easier for Egyptian parents like her to find resources for autism. "There is integrity and passion in everything she does," she says of Soliman, who has worked with her son since 2012. "This is not her profession, this is her life."